Illustration courtesy of Columbia Sportswear. I've worn Columbia Sportswear product for quite a few years now, and the story behind today's "Columbia" is a true American success story. "Mother Boyle" in some of the Columbia ads is Gertrude Boyle, who back in 1970 found herself a freshly widowed mother of three. Columbia, at that time, was growing but had challenging cash-flow problems. When Mrs. Boyle was told that the forced sale of the family business would glean only about $1400 she said, "For that kind of money, I'll run the company into the ground myself!" Well, that isn't exactly what "Gert" has done, aided by son Tim and daughter Sarah. Today, Columbia is one of the largest sportswear companies in the business. By 1984, they did about $3 million a year. Sales in 2005 exceeded $1.1 billion. Gert's favorite line from the old ads is, "Age and treachery will overcome youth and skill." I don't know about that, but I do know the Boyles' have done a fabulous job. Most Columbia product I've tested has buttons, snaps, and zippers that don't fall off, and has more pockets than you might think you might need, but are really glad you have. That apparently goes back to 1955, when Mrs. Boyle sewed the company's first fishing vest at the kitchen table. Her husband's fishing pals wanted more room and more pockets for flies, pliers, and other gear than easily could be had "ready made" at that time. That tradition continues today. The trademark of the Columbia line is the "three in one" approach, popularizing the Bugaboo ski jackets that can be worn as a unit or with the outer shell jacket or the inner jacket worn separately. 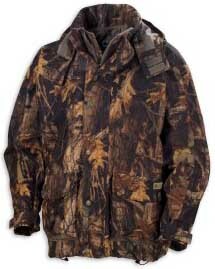 That also holds true for their hunting line, where you can customize you outerwear to fit your own preferences, selecting the combination of "shell" and "inner jacket" that fits your needs. Typically, the inner jackets (vests are available as well) are dubbed "liners," and you have fleece, "silent shell" material, "microtemp," and down inners to choose from (in increasing levels of warmth). I'm particularly impressed with the Columbia "Silent Shell II" material, which really stops the wind and is a good balance between warmth, light weight, and low bulk for all but really cold hunts. The "High Velocity Widgeon Shell" itself is constructed of what Columbia calls their "Omni-Tech Silent Rain Plus" material with "Ultra Wick brushed mesh lining." That's quite a mouthful, but it does block the wind well, breathes, and is not overly bulky or heavy. It is very, very quiet through the brush as the name implies. As expected, there are pockets all over the place featuring sturdy zippers and snaps; it seems hard to find a Columbia shell or jacket that doesn't have at least six. Whether you choose the blaze orange or the new timber wolf camo pattern, they share the same features with quick-draw hems on the bottom, adjustable cuffs, etc. Due to Columbia's extremely good distribution, you'll be able to mix and match quite easily with most of their line. The "High Velocity Widgeon Shell" is part of the new 2006 Columbia Fall "Big Game Hunting" offering, and is scheduled for general distribution late this summer. The Boyds have built their company over the years based on high quality product at a bit better price than their competition, and this year appears to be no exception. I couldn't find anything not to like about the High Velocity Widgeon Shell. I think you'll find it well worth checking out for yourself. Columbia continues to score big on the ski slopes and in the hunting woods, and it is easy to see why. For more info, see your local dealer or pay a visit to www.columbia.com.